Last weekend I chaired an International online symposium with 6 speaker hubs (Melbourne, Beirut, Ljubljana, Frankfurt, Amsterdam and Bern), ~40 listening hubs and 100’s of individual attendees logging-in via an app or their browsers from all continents on the globe. The technology worked remarkably well with no time delay when switching between speakers and answering questions. 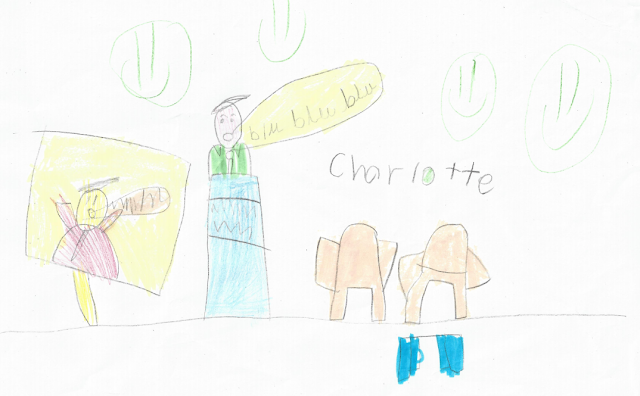 One of the observer’s in my speaking hub brought his daughter, Charlotte, along to the event and she took the liberty of drawing a picture of the stage in Bern. As you can see I am standing at the lectern speaking: ‘Blah, blah, blah, ……”. There is another speaker on the screen from one of the remote hubs and then their are two empty chairs. I simply love the picture hence my urge to share it with you. This meeting was a revelation to me and I can’t stop thinking about how many air miles, and carbon emissions, were saved by using new technology. The experience has buzzed me up so much that I am now exploring the option of launching OCTRIMS (Online Committee for Treatment and Research in Multiple Sclerosis). I envisage OCTRIMS being short themed online scientific conferences with short pecha kucha presentations in place of posters, a few keynote talks from leading experts, these will be TED-like talks no longer than 15 minutes in length, a sponsored online mini-symposium and a session for people with MS and their families. The idea would be to run OCTRIMS conferences live and to then put all the presentations on the web for asynchronous viewing. All the presentations will be open for Q&A for 1-2 week period to allow proper scientific discourse. OCTRIMS conferences will be short, succinct, high-value, high-quality, themed, free and most importantly environmentally friendly. If technology is changing the world why shouldn’t it change the way MS researchers share knowledge? What do you think? Drawn by Charlotte, Saturday 5th November 2016, Bern, Switzerland. How pharmas will do their marketing show in this OCTRIMS ??? Seriously for science and patients, it is a great idea. You will involve more researchers, as the cost will be minimal. And , in addition to be better for our planet, ultimately it will speed the understanding of the disease, best practices and new treatments. Re: "How pharmas will do their marketing show in this OCTRIMS ???" Pharma will be treated like any other researcher/scientist. They will be able to submit abstracts of their works and it will be peer-reviewed. We will also allow Pharma to sponsor mini-symposia, which happens already at other conferences. They won't be able to sponsor individuals to attend the meeting as we plan to make it free. Although, the latter is our aim, I am a realist; OCTRIMS will cost money and we will have to cover our running costs. I did not get time to comment on your post yesterday, but doesn't today's post contradict yesterday's post? I believe that technology will change how we do medicine but I believe that it will make things better. Teleconferencing is mature, medical tech for consults is a 'dial-up' tech level. We do not know how tech will integrate in the medical space, I think that data will be king, and the soft skills will be different. Unclear what that picture will be. RE: "…but doesn't today's post contradict yesterday's post?" No. Yesterday's post was about consultations between HCPs and Patients (one-to-one relationships). Today's post is about environmentally-friendly knowledge exchange between researchers and between researchers and patients. I've followed this blog since the start and have lost count of the conferences, workshops…. you have attended. Dining in posh restaurants, being picked up at the airport by a limousine. You always moan afterwards untill the next one comes along. I feel sorry for newly qualified neuros interested in research and looking forward to visiting interesting countries around the world. Will they get a chance to sit in airport lounges, wrack up millions of air miles? No. Prof G, 52, the most well travelled neuro on the globe, responsible alone for a 1C rise in sea temperatures, has decided that video conferencing is the future. I sold my BA shares today. I wrote to the PM to cancel the third runway at Heathrow. Have I been to quick? Brexit, Trump, Prof G not flying all over the world. What odds could you have got on these three seismic events happening? #ClinicSpeak & #BrainHealth: how much more data do we need to convince people to treat MS early?